Jason Woolgar has just had a note published in Small Carnivore Conservation on his encounter with the mega-rare – or at least mega rarely recorded – Poursargues’s Mongoose in Uganda. I’ve long had a hunch (I won’t justify it as a theory) that its possible to see just about every mammal species somewhere with relative ease. But for many species we don’t know where that “somewhere” is ….yet. Jason’s note is a little more evidence in that direction. Indeed, our growing mammal watching community is helping to fill in a lot of the gaps. Has anyone else out there been to Semliki? I wonder if the Mongooses are common there, or was Jason simply in the right place at the right time? I do think that the Pousargues’ Mongoose should be seeable in Semliki, as they have been recorded in the dense thickets on the Eastern side of Lake Albert in the past. I suspect that this mongoose is a species that has just not been recorded much in the past due to the nature of its range (incl. SE CAR, NE DRC, and N & E Uganda), much of which is inaccessible due to security reasons over the past several years. 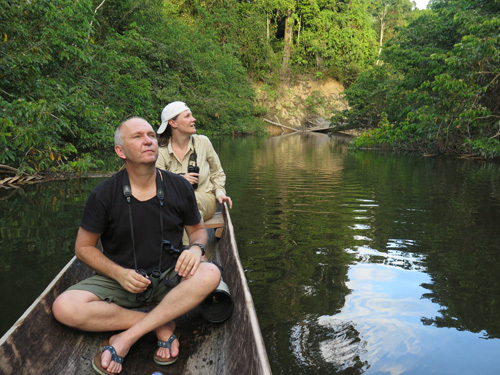 The other place where Pousargues’ Mongoose was recorded in recent years (a few years earlier actually) was in the far southeast of the CAR, in the Chinko/Mbari River basin. Over here, it just seems that the inaccessible nature of the area has prevented more records of this mongoose – as recent surveys have picked up a huge diversity of mammals in the region (incl. Caracal, Wild Dog, Lion, African Golden Cat, 7 Duiker sp., a bunch of mongooses, Elephant, Giant (Lord Derby’s) Eland, Bongo, etc.). A note was published on these sightings as well. See chinkoproject.com for more details. I briefly saw one in Murchison Falls NP in 2005, but I’m not 100% sure about the ID. In the same year I spent 2 days/3 nights in Semiliki Valley NP. Got a lot of interesting stuff there (20+ spp., incl. many primates), but no carnivores or ungulates. The best find was a dusky-footed sengi (near the hot springs), which is a little-known species with the range remarkably similar to that of Pousargues’ mongoose. Agreed Jon……it’s just finding that ‘somewhere’ that’s the bloody problem! I believe that these mongooses are common at Semliki and relatively easy to see, as I saw them two days in a row and the guides all knew them instantly. When I tried in December it was cold and wet and we only had an hour there late morning but were told by lodge staff that they are there most days in good weather and came to the area at the back of the kitchen most afternoons. They showed me a number of photos taken on their phones!